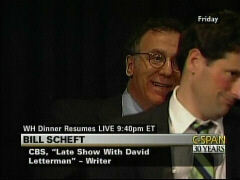 The proudest moment in his career, Late Show writer Bill Scheft boasted at a Friday comedy writer panel held at Washington, DC's Newseum, was when he got David Letterman to try to undermine guest John McCain's Bill Ayers talking point by raising McCain's relationship with G. Gordon Liddy -- as if a political dirty trickster were the equivalent of a terrorist involved with bombings which killed people, could have killed hundreds more if his attempts worked and remains unrepentant. At the event, organized by the Writers Guild of America, East, and shown Saturday night on C-SPAN, Scheft declared of his effort to discredit an anti-Obama point: “I'm more proud of that than any single joke that I've written.” That earned applause from the audience. Letterman Finally Makes Obama Jokes -- All Bashing Bush! As NewsBusters reported Monday, comedians just can't bring themselves to poke fun at Barack Obama. The challenge for us here at the "Late Show": what are we going to do to make fun of the President, because that's what we do, we take cheap shots at the President. And, we didn't know what to do the first four years of Clinton. We thought, "Wow, what's going on there?" And BINGO, in comes the heavy set intern, and BOOM. That was great. And then Bush proved to be another mother lode, I mean, what a rich deep vein that was. But now we're, thank you, but we don't know what to do with Barack Obama because he comes in and he hits the ground running, and whether he's doing anything good, he's at least doing stuff. He's gone crazy, he's always doing stuff. And I said, "Oh, God, I'm going to have to go back to telling toothpaste jokes." One would think it's bad host etiquette to call your guest a goon. Yet, David Letterman on Tuesday's "Late Show" did exactly that to Fox News's Bill O'Reilly. He also told the "Factor" host, "You're too smart to believe what you say." Audio: MP3 audio clip which matches the video clip (32 secs, 200 Kb). All the Presidents going back for “generations” before Obama were “evil”? Williams likely meant to say past presidential victors were seen as the “lesser of two evils,” but a greater percent of voters cast their ballot for Ronald Reagan in 1984 (58.7%) -- when plenty of Americans outside the media were excited about re-electing that President -- and George Bush in 1988 (53.7%) than chose Obama (52.8%). 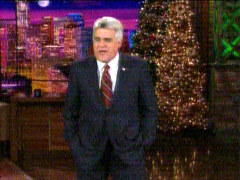 During this week, NBC’s Tonight Show host Jay Leno took a couple of noteworthy jabs at the anti-Bush mainstream media in America, on Monday joking that the Iraqi journalist who threw his shoes at President Bush was "offered his own show on MSNBC," and on Tuesday quipping that "he was so anti-Bush, at first people just assumed he was an American journalist." Did you know that the election of Barack Obama is the most historic moment in American history? Can I just say, on behalf of all the people of England, congratulations on your new President. We like him very much. Obama-supporting actor Alec Baldwin was David Letterman's guest on CBS's "Late Show" Wednesday evening, and actually had nice things to say about Republican vice presidential candidate Sarah Palin. She said to me, (imitating Palin) "'I've been talking to your (conservative) brother Stephen and we've been chatting, trying to figure out how to knock some sense into you." Appearing on Tuesday's Late Show, Josh Brolin, who plays George W.
And here's the third thing -- and I don't know much about the Bible and I'm not a big rapture guy -- but I believe George Bush is and what better way, if your polls are so bad, than to go out by pushing the button and destroying all life on Earth? Letterman, however spent the first half of Friday's Late Show before Williams came out and most of his time with Williams ridiculing Palin, and McCain for choosing her. 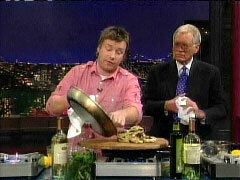 Though the NBC Nightly News anchor Williams tried to separate himself from the remarks, and made some gentle counter-points as he preferred to joke about how he's the only one of the three anchors yet to get an interview with Palin, Williams never made the obvious point that much of Letterman's upset over Palin's inexperience could be directed to the top of the competing ticket. Or certainly could have been when he emerged last year as a candidate, but was not.